I had a fantastic Jazz Night Out when I finally made it to Bungalow Jazz for the first time on Friday the 20th. Bryan Olsheski and the Bobby Floyd Trio performed two fantastic sets of nuanced straight-ahead jazz, with help from a few special guests. The finely-tuned trio of Floyd on the grand piano, Derek DiCenzo on upright bass, and Reggie Jackson on drum set, along with frequent collaborator Olsheski on tenor, was a well-oiled machine, with all members putting on wondrous solo displays but ready to play together as one unit in a heartbeat. Olsheski’s darkened lead on Bennie Moten’s “Moten Swing” tempered the rhythm section’s Sunday stroll, but he soon exploded with color on a swinging solo. The first half featured two pieces by jazz greats where the performers drastically altered the tempo. The trio played a beautifully intricate ballad rendition of Miles Davis’ “Seven Steps To Heaven” in 3/4, and then Olsheski returned for a sped-up take on Coltrane’s “Lonnie’s Lament,” which ascended from contemplative bop to an incendiary display with fiery passages from Olsheski, Floyd, and Jackson. The set break ended with a thrilling solo exploration of “All The Things You Are” by 14 year-old Columbus Youth Jazz Orchestra pianist Abhik Mazumder. The quartet returned and the second half featured some great Olsheski originals, including the joyously heartfelt “A Waltz for Ani,” dedicated to his young daughter. Former CYJO and FJO saxophonist Aaron Holbrook was in the audience while in town, and he sat in on alto saxophone for the final two numbers (plus the closing theme). Holbrook and Olsheski had a mesmerizing duet blowing session on “Cherokee” before they both turned in top-notch solos, and the tune ended with Jackson and DiCenzo artfully trading bars followed by the saxophonists doing the same. Finale “Bungalow Blues” was another Olsheski original, which he dedicated to the venue. Over a heavy, sticky blues, Olsheski’s solo slithered and shrieked, Holbrook’s turn had a lyrical but saucy feel, and skilled young pianist Dominic Baer sat in for his own hard-driving passage before the song ended with a mighty collective bang. I regret that it took so long to make the voyage to the Bungalow, but my excellent experience ensures that I aim to be back very soon! NOTE: Starting this week, I am changing the parameters of the weekly column slightly by focusing on shows for the next Friday through Thursday, instead of Thursday through Wednesday. I feel that this will allow information about great shows on Thursdays a proper amount of time to circulate to jazz fans, including the Nova Madrugada show listed below. As always, feedback is welcome – contact me here. Thanks! Saturday, May 28th (10pm – 1am): Groove Plexus and knots at Brothers Drake. A highlight of the weekend schedule will be this multi-genre rager at the meadery. The music of Detroit-based duo Groove Plexus resides in between electronic dance music and jazz, melding electronic beats and vocal samples with keyboard-based grooves. Local duo knots has been quiet of late, with their other project Radarhill preparing to release a new album, but I’m sure Caleb Miller (keyboards) and Troy Kunkler (drums) will be ready to party on Saturday. These two groups will be joined by experimental rock band Hundos. Cover is $5 and doors open at 9pm. Monday, May 30th (7:30 – 10pm): Vaughn Wiester’s Famous Jazz Orchestra featuring Ed Morrison at Clintonville Woman’s Club. This is the only jazz show in the area this Memorial Day (that we know of), but it will surely not disappoint fans of classic jazz, especially of the big band variety. West High School alum Morrison brings his screaming trumpet back to town in the second slot of a 3-week engagement at this reliable weekly event that has been happening for over 15 years (in one place or another) at this point. Enjoy some of Columbus’ best musicians playing excellent arrangements of great tunes – Cover is just $10 for adults and $5 for students. Thursday, June 2nd (9:30pm – 12:30am): Nova Madrugada at Carabar. Guitarist Stan Smith’s Thursday night series of free “tribute music” shows continues with this appearance with his long-running project led by bassist Roger Hines. The quartet of Smith, Hines, saxophonist Michael Cox, and drummer Danny Aguiar will be joined by special guest Bill Barner playing tenor saxophone on a handful of tunes. For their first appearance in some time, expect to hear some of the band’s familiar favorites as well as music from a Stan Smith album that he plans to release by early July. As Hines told me, Barner is a Columbus native who played with Smith and Hines in the Brazilian/world jazz group Sanctuary that played weekly at Oldfields on 4th when it was a jazz club some years ago, which was the group that evolved into Nova Madrugada. 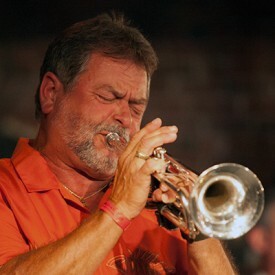 Now based in Washington, D.C., he recorded an album on clarinet entitled Ten Tunes at Sonic Lounge Studios in Grove City in 2011 where he was backed by Smith, Hines, and Aguiar. Expect to hear world-class talent playing world-influenced tunes in one of the most relaxed venues on the Columbus jazz scene.